Today’s bonus image: Turnaround of Mike’s suit (not including the PLSS). I keep messing with it so it’s not super accurate. My bio major is showing. I’m sorry, I should cover it, this is a bit embarrassing. Happier with “bacteroids” (without dobblet ‘i’)? 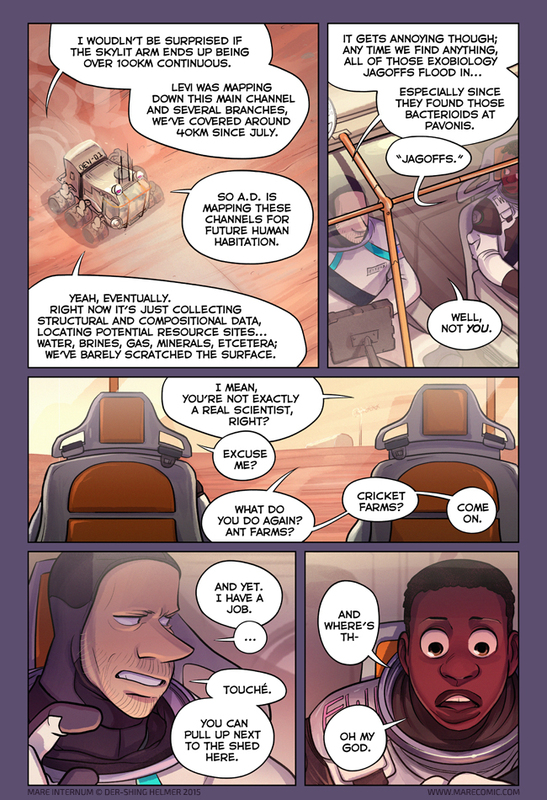 – Or does it go to the actual genus you don’t like for Mars? No I was just happy about microbes on Mars. Are we watching a tennis match? Because Mike just got served. …I’ll see myself out now. “jagoffs!” is mike from pittsburgh PA?? i’ve never heard the word used outside pittsburgh slang, which is a shame, since it’s a great word. lol, his old roommate was, I guess Mike picked it up from him. I will agree it is a fantastic word. It’s quite popular among Marines, too. I heard from one of them that it originated as a slang for military lawyers (JAG officers) but that directly conflicts with every other history I’ve heard for the term. The guy’s a Marine, though, so I’m not about to correct him. Eeeeee, I got really excited about the Pittsburgh slang too! Sad to hear Mike isn’t a yinzer, but excellent use of the “jagoff” all the same. The suit turnaround: The feet part makes an impression of high heels, so Mike is quite fabulous. It makes his calves look fantastic! Is there a recirculating (scrubber) system with this one because it looks complete without a large backpack for tanks? Does it have an onboard computer with display? I could see a projection system on the bubble for a HUD- also to replace rear-view mirrors with a small video camera covering that blind spot in the back. Yeah, like it says up there this doesn’t include the backpack/ PLSS part of the outfit XD It would be nice if you could get all that life support stuff inside the suit itself somehow haha. But yeah they have an interface on the inside of the helmet as well as a tablet to carry around, and a little wrist comp that runs the Buoy system they’ve been using in the comic so far. The worst part of a self-contained suit would be the self-inserting catheters. I need to adopt “jagoffs” into my vocabulary. XD And is it bad that I actually enjoy watching them bicker? but you can’t ship them ! Probably just referring to lava tubes, considering that Devotion Base is in the Tharsis Montes region. Would love to see a turnaround of Bex’s suit. I actually like it better than Mike’s, but then I’ve always been a fan of the rugged functional look over streamlined and modern. When I adjust my steampunk goggles it looks even better, but six of one, half-dozen of the other! But we’re not privy to information like which suit actually works better, with the right insulation and substrates to keep you cool or warm, for example. The Kitten looks like it has eyes.